One piece solid timber blank. Hand shaped by Oswald Downing. Bottom image above. FIN: none, standard for the period. 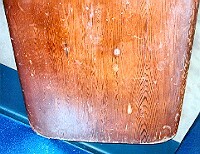 The board was shaped from one piece of solid timber, probably by Ossie (O. E.) Downing of Manly in 1917. 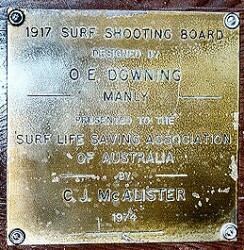 Oswald Downing was an early board builder and a trainee architect and had drawn up plans from Duke Kahanamoku's board. These are possibly the Plans and Specifications printed in The Australian Surf Life Saving Handbook, first edition circa 1923. See details in the 1938 Tenth edtion. A contemporary newspaper report of a surfboard race, lists Oswald Downing (Manly) in second place. A similar report of the Bondi Championships, April 1921, records the results of a surfboard race as 1. A. McKenzie (North Bondi) 2. A. Moxan. Other starters Oswald Downing and Claude West (Manly). 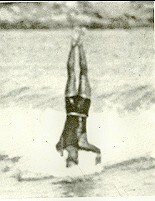 Oswald Downing added to his his competitive record with third place at the 1922 'Australian' Championships at Manly, won by Claude West (Manly) and A. McKenzie (North Bondi) second. Around this time, the board was accquired a young Manly surfer, Snowy McAlister. Charles Justin 'Snowy' McAlister saw Duke Kahanamoku in 1915, and soon after began surfing on his mother's pine ironing board ... I used to wag school and rush down to the beach with it. because I would come home sunburnt. - Quoted in Wells, page 159. Snowy mcAlister and (possibly) the Downing board, Bondi, circa 1925. Note that Harris dates this photograph as 1920, but that seems unlikely. Snowy McAlister was a talented surfer, confirmed with his win in the surfboard display in the1924 'Australian' Championships at Manly. The start of a impressive competitive record, 'Snowy' McAlister won board displays in Sydney in 1923-24 (Manly), 1924-5. (Manly), 1925-26 (North Bondi) and 1926-27(Manly, second Les Ellinson). 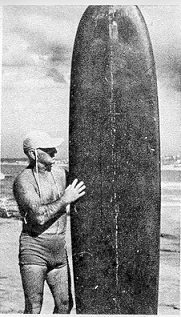 Following the introduction of the Blake Hollow Paddleboard in 1934, Snowy McAlister turned to the surfski as his preferred wave riding craft. Snowy McAlister and (probably) a self shaped board, Manly circa 1928.
longtime rider, C.J. ‘Snow’ McAllister." Modern World Magazine, July 1971, pages 30 - 36. .In 2002 it was relocated to the Surf Life Saving Museum, Surf House 1 Notts Avenue Bondi Beach NSW 2026 where it is on display. The board is mounted offset on the wall with brackets clasping the rails. Unfortunately it is difficult to examine the deck features. 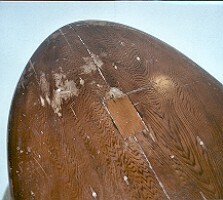 The board is heavily scarred, with a large central split in the nose. A block of different grained timber is inserted in the bottom near the nose, possiblly as a key to stop further splitting. 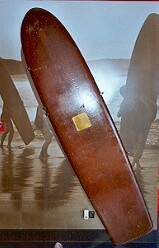 The board does not appear (by touch) to have the common Australian metal nose plate. CONDITION: 9, added features, some splitting. Geoff Cater (2002-2014) : #175 O.E. Downing Redwood, 8ft 6'', 1917.